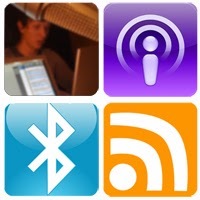 fatBuzz: Podcasting isn't dead, it was just waiting for technology to catch up! Podcasting isn't dead, it was just waiting for technology to catch up! Finding an audience is not easy and as the volume of content increases it will get more difficult. Facebook is a good example of the diminishing reach you can achieve even to the people who have liked your page; some reports estimate it as low as 2% of your community will see what you post on your Facebook page. Facebook want you to pay to boost your posts, an inevitable outcome after they acquired demanding shareholders! The increasing variety of niche content is also making it more difficult to find new blog readers; consumers are blessed with enormous choice, however finding the time to consume content seems to be increasingly more difficult. So, perhaps it's not surprising that podcast consumption is on the increase but it's not particularly due to the problems encountered on other platforms, there are very good reasons why this technology is enjoying a healthy growth. More recently, Libsyn reported the number of podcast downloads form their platform during the 1st quarter of 2013 exceeded 28 million, an increase from 20 million for the same period in 2012. And, in July 2013 iTunes announced their store had exceeded one billion podcast subscriptions. We are delighted to report a similar growth pattern with our own Social Media Podcast. In fact, the number of podcast downloads for each episode significantly exceeds the number of page views on any blog post; and it comfortably exceeds the reach of any Facebook post we publish. This is significant because these are very much opted-in subscribers; they have chosen to subscribe to the podcast or to download a particular episode, therefore we are talking directly to someone who has chosen to listen to what we have to say. Of course, podcasts can be in a variety of formats, the Social Media Podcast is a discussion format however clients are experiencing significant success by using podcasts to demonstrate their expertise in their particular topic - something the medium is ideally suited to. On many occasions we find people can express their expertise and passion orally much better than they can in the written word. Moreover, it is much easier to consume podcasts and listen to them when you have the time to do so - while you're driving. More and more new cars have Bluetooth connectivity and a recent report by Strategy Analytics suggest that over 90% of all new cars will have Bluetooth technology by 2016. This means you no longer have to suffer irritating ear buds, you can easily listen to your chosen content through your car's sound system. I'm pleasantly surprised by the number of people who tell me they listen to podcast content in their cars; many of them, like me, prefer to use commuting time productively rather than listen to some overly lively radio presenter playing telephone pranks! If, like many organisations, you're finding it increasingly difficult to extend the reach of your content you should take a closer look at podcasting; it's certainly not dead, it was just waiting for technology to catch up! You can listen to the latest episode of the Social Media podcast here, it may give you some ideas about what you can say to an opted-in audience.